Commission chairperson Kgalema Motlanthe, third from right, and his team. THE opposition MDC party has expressed concern over the manner in which the Commission of Inquiry into the deadly August 1 post-election violence carried out its mandate and the speed with which the panel has been able to produce its initial report. The comes as the presidency made it clear there was no obligation, at law, for President Emmerson Mnangagwa to make the document public. Mnangagwa however said he would make the commission's findings public. 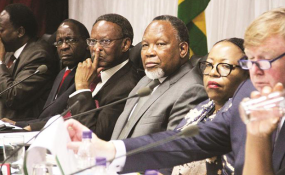 Led by former South Africa president Kgalema Motlanthe presented an executive summary of its findings to president Mnangagwa at the weekend. Presidential spokesman George Charamba told state media that the document was now under lock and key. "There is nothing at law that compels the President to release the report to the public or not to release it to the public," Charamba told a local daily. He added; "I can confirm that last week the President received the only copy of the executive summary which was put under lock and key soon after he had gone through it." The panel's three-month mandate was due to end on the 19th of December. In an interview with NewZimbabwe.com, MDC spokesman Jacob Mafume said the opposition party was concerned that the Commission had managed to come up with an executive summary so quickly after concluding public testimonies. The Commission concluded evidence gathering last Wednesday before presenting its executive summary to President Mnangagwa on Saturday. "While we cannot comment on the content as we have not yet read the report or been furnished with the executive summary of the report as they want to call it, we have been concerned with a number of issues right from the beginning of the process," said Mafume. "The report took a day or 24 hours to be done; that is record time. How do you sift through the evidence; how do you weigh the evidence? "How do you edit as a group? Who edited on behalf of them, where have they shared? Are there any contradicting opinions? Surely all of them with their diverse backgrounds cannot think the same about the same pieces of evidence." He added; "There should be some debate, verifications; volumes of videos, audios and expert evidence that need to be sifted through. It would seem the report has moved faster than the evidence, before the evidence could even settle in the mind of the people and the commissioners and the mind of anyone. "The executive summary is already out. We are skeptical but, we will not hold our breath and certainly give a full comment once the report comes out." Six people died after the military was deployed in central Harare as pro-opposition activists protested against the delay by the Zimbabwe Electoral Commission (ZEC) to release the presidential election results. President Mnangagwa appointed the Motlanthe Commission following local and international outrage over the killings. The government promptly blamed the opposition for the violence, allegations profusely denied by the MDC leadership when they appeared before the Commission. According to Mafume, the MDC had a number of reservations about the commission, including its failure to call President Mnangagwa and his two deputies to testify. The opposition has also criticised the inclusion of Zanu PF member and University of Zimbabwe lecturer Charity Manyeruke on the panel. However, this was dismissed by presidential spokesman George Charamba who told State media Monday that; "It's rank dishonest to slate a commissioner merely for being a member of Zanu PF, who is not even an office holder, while turning a blind eye on another commissioner who was not just a politician, but a candidate in the 2018 elections."